There are many different styles of quilts. The motivation behind the design of each style can be vastly different, as is often the history and the materials and fabrics used. In this section you can learn about the many different popular quilt styles (and some of the more unusual ones too!) and find guides on how to incorporate these styles into your own designs. With time and practice you may even find that you eventually develop your own quilting style! Every baby deserves to have their own quilt or blanket. 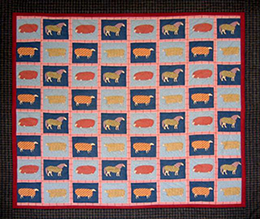 Baby quilts can be used during their early years and kept as a memento when they are older. Everybody loves the festive season and what better way to celebrate it than with your very own themed Christmas quilt! Cathedral window quilts take their inspiration from the beautiful shapes and patterns of the stained glass windows found in churches and cathedrals around the world. Women played a fundamental role in the American Civil War effort by making quilts for the soldiers. Read about this unique style of quilt making that emerged during these difficult times. One of the largest forces of inspiration in quilting is the work of the Amish people. Read about their original designs and unique style of quilting. Rag quilts are the latest trend in quilting. They are a quick, fun and unique type of quilt that offers a refreshing break from traditional quilting. Traditional Hawaiian quilts primarily feature elements derived from nature. Learn more about the history and designs of this unique style of quilt. Memory quilts are a great way to remember or celebrate your family history, the life of a loved one or an important event in your life. Photo memory quilts are become increasingly popular and easier today as the process of transferring photos to fabric becomes available to everyone. Patchwork quilts are made by sewing little patches of fabric together. Read more about this traditional and very popular style of quilt. Do you have lots of left over farbcis from pervious quilts or sewing creations? Learn how to make a scrap quilt using all the pieces you never thought you could!